Definition - What does Bound Revolved Squatting Toe Balance mean? Bound revolved squatting toe balance is a challenging twist that improves balance and provides a range of other physical benefits. 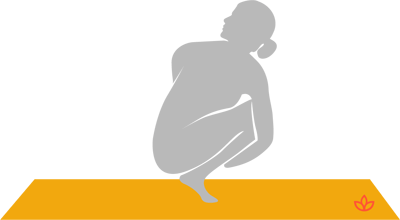 This pose is practiced from a deep squat with knees together and the buttocks resting on the heels while balancing on the toes. The torso twists to one side. The bottom arm wraps under and around the knees, while the top arm reaches around the back to grab the opposite wrist. The posture is considered a variation of noose pose, also known in Sanskrit as pasasana. Noose pose is typically practiced with feet flat on the ground. Bound revolved squatting toe balance is also believed to ease asthma, menstrual pain and sciatica. In the full expression of this pose, the gaze is over the upper shoulder, but those with neck injuries should keep the gaze straight ahead. Beginners or those struggling with balance may practice the non-bound version, revolved squatting toe balance, with a modified arm position using a yoga block for balance.